On this page you will find Free Printable Baby Animal Name Scramble Puzzle in three different colors. 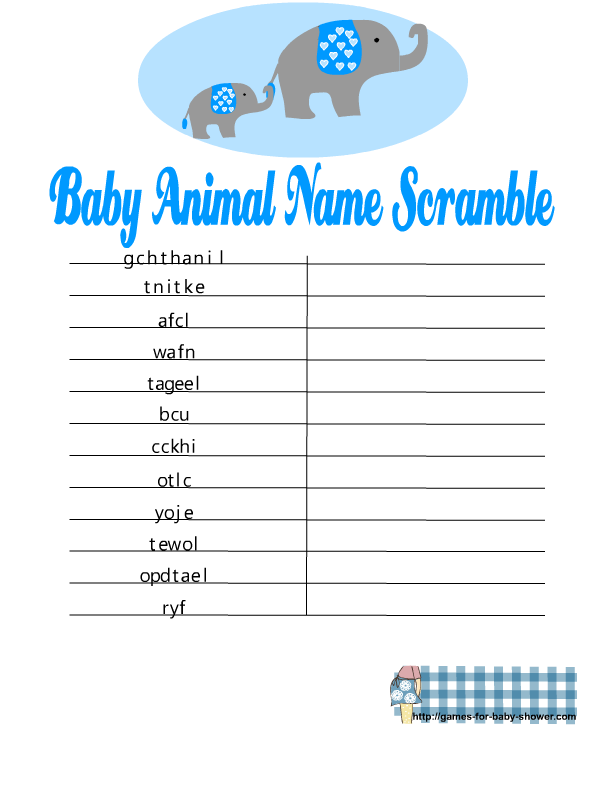 Baby animal name scramble is a fun word game with a twist. You can download this game in yellow color for a gender-neutral baby shower, pink for girl baby shower and blue for a boy baby shower. How to Play: Print and distribute the baby animal name scramble cards among the guests and give them a pen or pencil along the cards. Set the timer on your cellphone to 3 minutes. Ask the guests to unscramble the names of all the baby animals. The person who unscrambles most animal names correctly within three minutes, he or she will be the winner. This is a free printable baby animal name scramble card in yellow color. This cute printable game is decorated with a mama animal and a baby animal. Just click on the thumbnail image of this game and print the bigger image. Click on the image given above to get the bigger version of this blue baby animal name scramble puzzle. This game card is decorated with two cute blue elephants. This is another cute color for this adorable puzzle game. Just click on this thumbnail and a bigger image will open up, right click and save that.